During the 15th Century, the Gothic Germans were developing spiked war hammers that were just as aesthetically pleasing as they were deadly. The Fisted War Hammer replicates ones such weapon with strikingly accurate detail. This hammer, known in German as the dolchstreithammer, depicts the image of a hand clutching something akin to a giant nail. The flat end of the high carbon steel head makes a perfect square, perfect for putting a dent in plate armor, and the other end of the head ends in a long, curved spike. 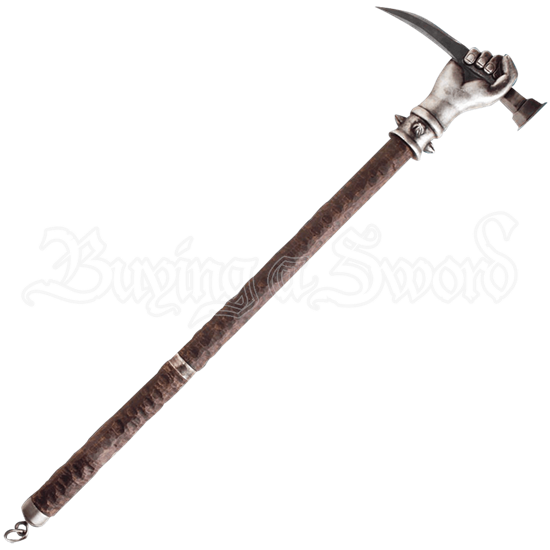 The long, hardwood shaft of this weapon ends in a steel ring for a wristband or for hanging on a saddle, and the entire item has been stained and finished to give it an antique look. The Fisted War Hammer is a perfect functional item for lovers of medieval warfare, and because its design is so artful, it makes a great decorative piece as well.